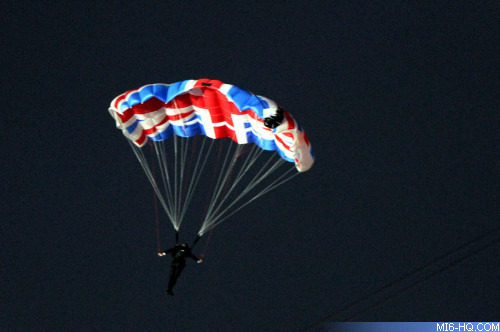 Daniel Craig, in character as James Bond, helped open the 2012 London Olympic Games tonight by accompanying Her Majesty Queen Elizabeth II to the stadium in a scenic helicopter ride over London. You must have the Macromedia Flash Player installed to view this video content. The short film "Happy and Glorious" by director Danny Boyle was shot in March, but played in 'real time' during the ceremony, with a helicopter hovering over the audience for the transition to live action. Stunt doubles were used for the parachute jump and Daniel Craig was not actually at the event tonight.